Just popping in to share this little quilt with you today! 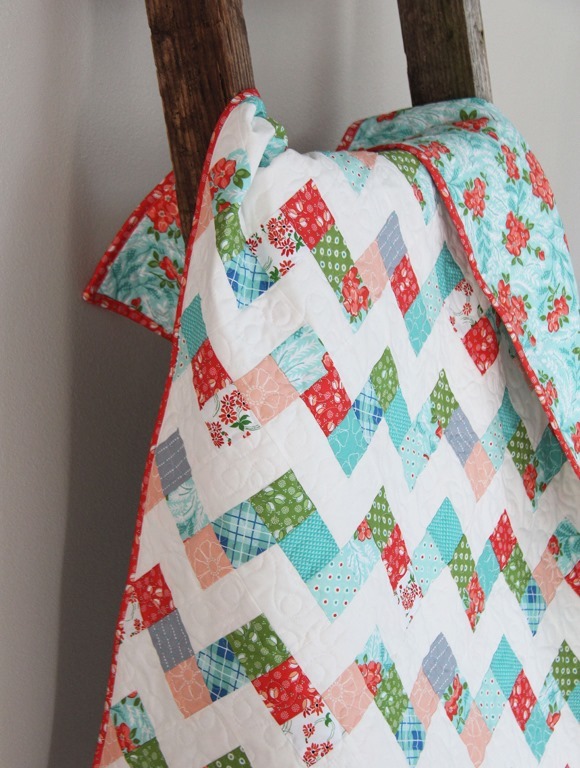 I made this quilt in little bits here and there using my Hazel fabric and the Frolic pattern. Big chunks of time to sew are hard to come by these days…so little bits of time here and there will have to do. I’m actually more productive when I have 15 minutes to sew instead of 2 hours…it forces me to focus and get crackin’! I know I’m a broken record but I really love this fabric. I like it too….it's very vintage looking to me. It's so pretty. I can't see a thing wrong with it. You're so funny — your late night quilting looks better than what most of us can do at the top of our game. I know what you mean about the 15 minute sewing sessions. They really recharge me, and it's so motivating to see a whole quilt gradually taking shape from those spare moments that could easily have been wasted. It's one of the reasons I feel blessed to have a dedicated sewing space, because if I had to drag everything out every time I wanted to sew and then pack it all up again afterwards, I would never get to sneak in a "quickie quilting session!" Congratulations on your lovely finished quilt. Love it :). 15 minute magic… I need to give that concept a whirl. Frolic looks wonderful in your new fabric. I love this with all my heart. that turned out so fresh and pretty!!! So very pretty and sweet! Very Sweet, I just love it! Very Nice. Great idea on how to use you time. Its so very pretty. 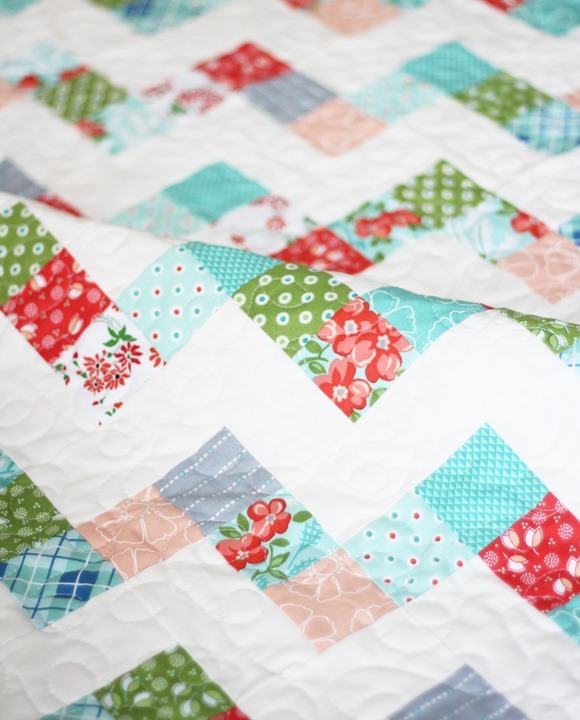 And no, you can't see whatever flaws you see in that quilting. It looks great. I LOVE Hazel! Can't wait to buy it! That's beautiful! I love the soft colors. I love this fabric too! I'm keeping an eye out to see if I can preorder it somewhere:). The quilting looks good to me! Love the fabrics and the pattern – looks so fresh with the white. Those little moments to sew are precious and help to make a day complete! I try to get up early to push a project along but sometimes the results aren't too good – like cutting out setting triangles at 5am – big mistake(s)!!! It looks wonderful! I have to be careful about piecing super late at night… I start to sew things with the wrong sides together, seams get all sorts out of whack, etc. Looks great! My rule of thumb is to never cut fabric when I'm even the least bit tired. I ALWAYS make a mistake when I try and do that. I love your fabric too.. clean colors and lines in the pattern… against the white background… would love to make this quilt..
Love this quilt! It's going on my "to do" list. I’m new to all this.. 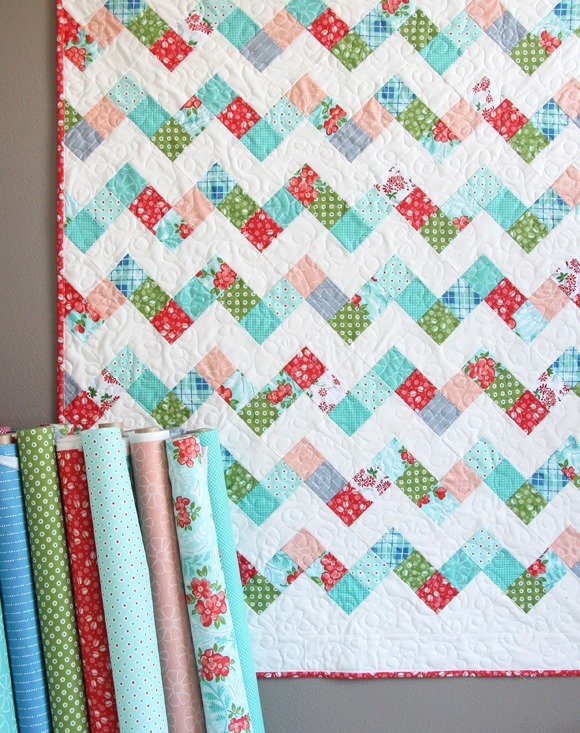 So, where are the patterns/directions for the quilts on here?